A wickedly delicious wine collection is set to spellbind the nation this Summer with the launch of 'The Magic Box', a new range of contemporary Australian wines. Inspired by the magic of winemaking, the collection offers exceptional flavours based on classic varietals. 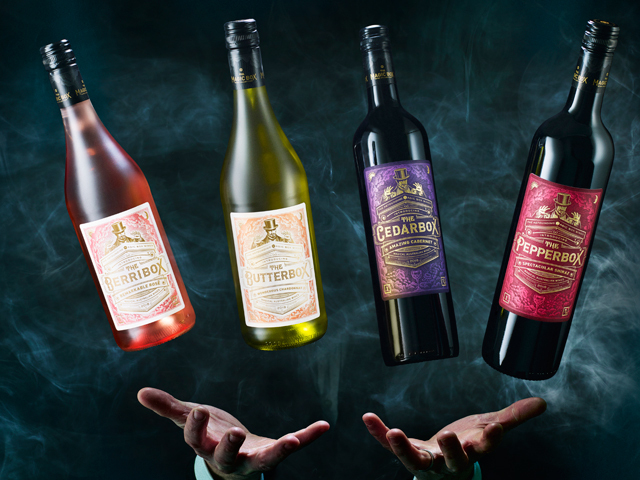 The Magic Box headlines four wines with charming designs and names- PepperBox Shiraz, CedarBox Cabernet Sauvignon, ButterBox Chardonnay, and BerriBox Rosé. If red berry fruits and a pop of spice excite your taste buds, the full-bodied 2018 PepperBox Shiraz will be your showstopper. The PepperBox bursts with caramel flavour and is ideal to enjoy with food or on its own. Immerse yourself in an infusion of powerful black fruits like blackberry and plum with the CedarBox, a bold and deep purple 2018 Cabernet Sauvignon with hints of mocha. For those who prefer a lighter wine, The Magic Box's master craftsman has married ripe fruit and vanilla in the 2018 ButterBox Chardonnay, unlocking a palate that is distinctively true to its name. The final Magic Box reveal comes from the 2018 BerriBox, highlighting aromas of strawberry, white peach, and cherry. This refreshing Rosé is sure to conjure an evening of delight with its vibrant and crisp fruit crunch. The Magic Box Collection invites you to explore a new world of wine full of extraordinary taste. Magic Box Wines are available now at major retailers, Dan Murphy's and BWS nationally, and selected independent retailers at a RRP of $14.99 each. Review: As the name suggests ButterBox Chardonnay has Buttery tones, with lots of Oak, quite smooth and the reasonable price makes this a great festive wine.